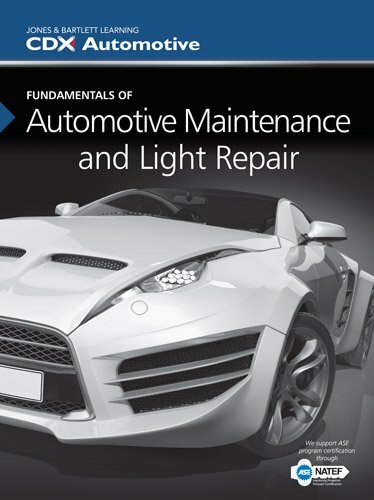 Based on the 2013 National Automotive Technicians Education Foundation (NATEF) Automobile Accreditation Model and Task Lists, Fundamentals of Automotive Maintenance and Light Repair offers comprehensive coverage of every task with clarity and precision in a concise format that ensures student comprehension and encourages critical thinking. This textbook provides all of the foundational theory and skills necessary to prepare entry-level technicians to maintain and repair today's vehicles. The textbook was built with an unrivaled focus on developing hands-on skills that will be required in the shop. Additionally, CDX Automotive's renowned Know-See-Do-Prove instructional methodology is reinforced throughout the text with icons so that students always know where they are in the learning process. Almost 200 Skill Drills that provide written, step-by-step instructions and visual summaries of important skills and procedures. You are the Technician case studies open each chapter. These cases encourage active learning, promote critical-thinking skills, and help students make the connection between cognitive information presented in the text and real-life situations. Applied Math, Science, and Communication boxes simplify critical academic concepts and help students apply these concepts in the shop. Technician Tips supplement chapters with advice from expect technicians and key tricks of the trade. NATEF Tasks, Knowledge Objectives, and Skills Objectives open each chapter to help students and instructors know exactly what is being covered. A bulleted wrap-up of the chapter, key terms, and ASE-Type Questions conclude each chapter.